Producer Rodney Jerkins will finally release his much-discussed all-star remake of "We Are Family," a benefit for Points of Light Foundation's Hurricane Katrina relief efforts, February 27. Chris Brown, Ciara and Ray J are among those who guest on the song, which reunites Sister Sledge for the first time in two decades. 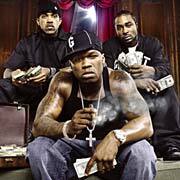 G-Unit and Sha Money XL are also recruiting some big names. The two are helping pull together a star-studded panel for the One Stop Shop Conference, a two-day workshop geared toward music producers. Swizz Beatz, DJ Premier, Hi-Tek and others will participate in the event, taking place February 10-11 at the Hyatt Regency in <?xml:namespace prefix = st1 ns = "urn:schemas-microsoft-com:office:smarttags" />Phoenix. The workshop will conclude with the One Stop Shop Beat Battle Final Round, with G-Unit members, Sha Money and others acting as judges. Sign up to receive the latest wireless alerts of hip-hop news from Chronicmagazine.com!